Pre-testing: My arms only weigh 10 pounds?! Since Andrew works in obesity prevention research, he knows people with really cool machines that can measure exactly how much fat, muscle, and bone is in our bodies (dual x-ray absorptiometry or DXA) and precisely measure how many calories we burn at rest (MOXUS). They drew some blood just for fun and we also worked with a personal trainer who used skin calipers to measure our subcutaneous fat. Although this is not practical for everyone, there are other ways to determine some of the same information. Thanks to the great staff at Arkansas Children’s Hospital (ACH) Research Institute! We look forward to following up after our thru-hike. Percentages are based on age and gender. Numbers vary by source and are still debated. First of all, determine if your goal is to gain weight, lose weight, or stay the same (for the trail or just in life!). It is not a perfect tool and you may be saying, “… but I have big bones,” or “I’ve always been this size,” or “I have so much muscle mass and muscle weighs more than fat.” (Point 3 is true for professional athletes.) As a dietitian, I hear these phrases almost daily. However, BMI is the best evidence based tool that we have for determining risk for cardiovascular disease and diabetes. Good news- losing even 5-10% of your current body weight (if overweight or obese) can help reduce your risks! Note: if you are over the age of 65, your healthy BMI range changes to 23-28, rather than 18.5-25. BMI tools, including calculator and chart. Your basal metabolic rate (BMR) is an important number for you to know! Your BMR is the number of calories you would burn just staying alive for 24 hours, without additional movement or activity. Certainly, listening to cues from your body will tell you if you are losing or gaining weight while on the trail (or at home for that matter). However, when packing boxes and estimating how much food to bring, knowing your BMR will allow you to be as accurate as possible. To determine my BMR, I spent 30 minutes at rest under a little contraption called a MOXUS metabolic modular. I was fasting and I was not allowed to move, talk, or sleep during the study. The MOXUS measured my metabolism based on the amount of oxygen I converted into CO2 during the test. In my case, I consumed 6.3 liters of oxygen and produced 5.8 liters of CO2 . Andrew went through the same process. His needs are much higher, consuming 9.9 liters of oxygen and produced 8.7 liters of CO2 . Based on these amounts, my BMR is 1,521 calories, and Andrew’s is 2,344. Another interesting function was determining what percentage we use of various sources of energy. Energy in the form of calories comes from 3 main macronutrients: fat, carbs, and protein (alcohol is the 4th). Andrew is burning 43% of his energy from fat, whereas I am only burning 27%. The rest is from carbohydrates and a negligible amount from protein. In order to preserve lean muscle mass, the human body avoids burning protein for energy. It is helpful to burn energy from fat because our fat stores are much, much greater than our stores of glycogen (from carbohydrate). Therefore, if you can burn fat, you can last longer. This may explain why I require small, frequent meals (refueling with carbs) and why Andrew’s body fat percentage is so low (burning fat for energy). We will compare all of these numbers after our hike to see what changes have occurred. Once you know your BMR, you can use either an activity factor (based on lifestyle), or metabolic equivalent (MET) factor, which is a multiple of your BMR. The MET Factor for hiking is 7, meaning that the average person needs 7 times more energy when they are hiking than when they are at rest. See tables below for comparisons! Note: the website uses estimates based on the Harris Benedict formula to predict resting energy expenditure. We found that ours were underestimated by the Harris Benedict formula. Andrew’s predicted calories in 24 hours is 1,974. However, the MOXUS indicates that his metabolism is significantly higher and so he is actually burning 2,344 calories per day at rest. Mine was also higher than the estimate, 1,522 calories compared to the predicted 1,292. We’ll follow up at the end of our hike to let you know which one we believe to be most accurate! DXA scans are pretty neat. If you’ve ever wanted to know what percentage of your left arm is muscle or fat or bone… this is the machine for you! 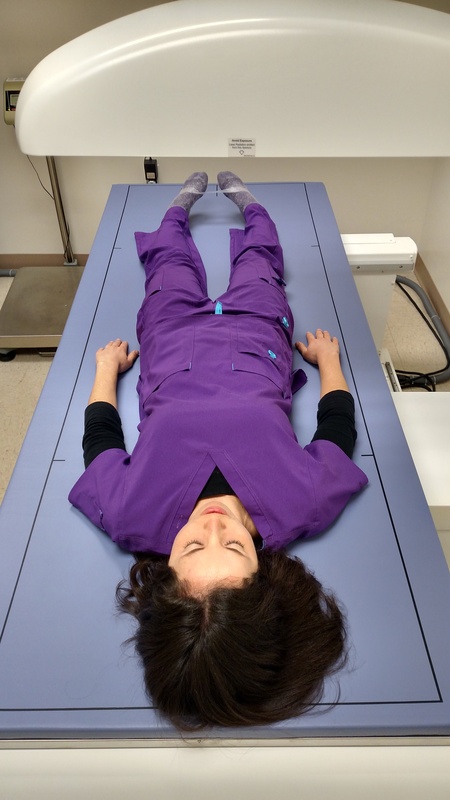 With DXA, I laid down on a table and the RN positioned my arms and feet in a specific way. The machine scanned my body for 6 minutes and then produced a detailed report. It is simple and painless and provides a wealth of information. From this, I learned some trivial information, as well as some useful measures. For instance, my arms combined only weigh 10 pounds, and my legs weigh 40! Andrew’s arms weigh 21 pounds, and his legs are 63 pounds. We could only guess that we will gain muscle mass in our legs and lose mass in our arms while hiking. We are planning to use trekking poles, so we may use our arms enough to maintain muscle mass. In addition, we met with a personal trainer and she measured our fat with skin calipers on 3 body points: arms, legs, and abdomen. 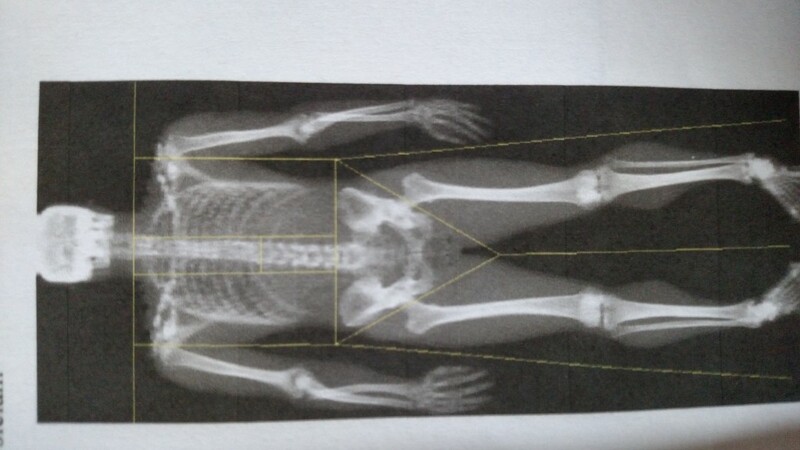 This is a measure of subcutaneous fat. See comparisons in “initial results” chart above. VO2max is a standard measure for athletes to test their aerobic fitness. The results of a VO2max test tell you the maximum amount of oxygen your body can process. The personal trainer at ACH measured our VO2max using a sub-maximal graded exercise test. She had us wear a heart rate monitor, and put us on a stationary bike. During the test she increased the resistance every few minutes, until we reached a certain heart rate threshold. Based on our amount of effort at our heart rate threshold, she calculated our VO2max. See results in “initial results” chart above. Bottom line is that you need enough calories from food to provide your body with energy for the best performance. Know your needs. Do you need to lose weight? Do you need to gain weight? Are you at a healthy weight? Determine your baseline calories and adjust. Our next post will give you tangible ways to pack food based on your calorie needs for backpacking. We have packaged our food based on a total of 9,000 calories per day between us. Will that be enough?! We’ll find out! When we complete the AT, we will participate in a post-test for the researchers and if there are any interesting findings, we will become a case study! Very cool!! I doubt the standard insurance will cover this as a wellness check. I’d be interested in doing the same. Have you done this before? I’m more curious about what the machine says versus what your stomach says. If you can test without being a burden, I’d want to know what the calorie count is for tossing and turning. Even if you’re home sick, you’ll still lay in bed watching TV or reading a book. No one lays still without sleeping for any length of time. It would be interesting to see how the calculated matches daily and then again for highest activity vs hiking. Be sure to update when you’ve tested theory to reality. In the meantime I’ll do it the easy way, eat when hungry. I’ve got a lot of experience at that. Bob, I have the same questions! I have used this method of food packing for extended trips in the past (which I’ll document sometime in the near future) but this is the first time that I have had all of the metabolic testing done beforehand. At home, I don’t count calories but depend on body signals and routine to maintain my body weight. When I’m training for races (running), I eat more, when I’m doing cardio maintenance, I eat less. I believe in mindful eating and intuitive eating. However, I’m like you- I’m very curious what the numbers/science says compared to what my body will say. I’ll keep you posted! Hey, Bob! I was once able to get a DXA scan done as part of a medical test that I participated in at the University of Minnesota Medical School. Contact your local University – you might be surprised at what kinds of cool scans/measurements you can get done for free if you’re willing to be poked and prodded by a doctor! That’s a great idea, Renee! I have found that people love to help thru-hikers and enjoy participating in various aspects of the experience. Sometimes it doesn’t hurt to play the thru-hiker card! I was thinking that. Johns Hopkins is huge here and they love them some research. I’ll have to poke around the internet and see what I can find. Wonderful reporting! I’ve seen very little of this depth as it applies to backpacking. Thanks, Mark! I appreciate your feedback! How are you able to determine the amount of each macronutrient burned for energy.